The holidays are a wonderful time of year when you can get together with family and friends. It also offers the chance to eat some terrific meals. Unfortunately, those meals aren’t always the healthiest choices you can make. When you factor in most kids having two weeks off of school, it can be easy to slip into some bad habits. If you live in the southern or western parts of the United States, winter break usually means warm weather – or at least warm enough to not have to worry about bitterly cold weather keeping you indoors. For people in the upper Midwest, Great Lakes areas and northeastern parts of the country, being outdoors and active can sometimes be challenging, not to mention totally dependent on the weather. No matter what, it’s important to get out and stay active during the break. Sledding is not only great fun for everyone, but it can be a great workout. Why? Because after you go downhill, you have to get back up to top. Dragging a sled – not to mention yourself all bundled up in winter clothing – up a big hill can be a terrific way to burn off the extra desserts that we all inevitably have during the holidays. Depending on where you live, tubing is also a popular activity. Tubing hills are usually much higher than your average park, and some facilities also have a moving sidewalk to get you and your tube back to the top of the hill. But it still requires work to get your tube from the bottom back to the transportation to go to the top. You don’t have to be a hockey player or figure skater to enjoy ice skating. Many indoor rinks offer some type of support for younger or newer skaters to hold on to as they make their way around the rink. Also you can always rent skates so you don’t need to worry about having your own. 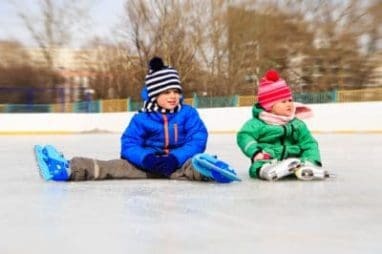 If the weather isn’t too cold, your city may have outdoor rinks that they maintain during the winter, so you can get fresh air while skating. One of the highlights for many people in December is seeing great Christmas light displays. Leave the car in the garage and take a nice evening walk to see the neighborhood lit up for the season. If your area is lacking, drive to a neighborhood that has great displays and walk around there. It may not be the greatest workout you can get, but bowling is not only a fun activity for the whole family, it’s weatherproof. No matter how warm or cold the weather might get outside, bowling is a great way to be together while taking part in an activity. Being a tourist in your city is a great way to see the sites that you may not otherwise get to see in your day-to-day life. Between going to work, getting the kids off to school and chauffeuring everyone to their extracurricular activities, it can be easy to miss the fun things that our hometowns have to offer. Go see parks or museums that you may not otherwise get to enjoy and take in all that your city has to offer. Finding fun things for the family to do together over the holiday can be stressful, especially if your car is on its last legs. But with great deals at the end of the year, now is the time to get a new car. If that’s your plan let Wheels For Wishes take your unwanted vehicle off your hands for you. We offer free pick-up or towing, and you can get a tax deduction just in time for the New Year. Any donation we receive online before 11:59 p.m. on Dec. 31 will count for this year’s taxes. On top of a tax deduction, our program also benefits local Make-A-Wish chapters and helps them grant the wishes of kids in your area! To donate your vehicle, please call 1-877-431-9474 or donate a car online with our online donation form.